Independent mortgage banks and mortgage subsidiaries of chartered banks reported a net gain of $237 on each loan they originated in the fourth quarter of 2017, down from a reported gain of $929 per loan in the third quarter of 2017, the Mortgage Bankers Association (MBA) reported today in its Quarterly Mortgage Bankers Performance Report. Average production volume was $505 million per company in the fourth quarter of 2017, down from $569 million per company in the third quarter of 2017. The volume by count per company averaged 2,059 loans in the fourth quarter of 2017, down from 2,341 loans in the third quarter of 2017. For the mortgage industry as a whole, MBA estimates for production volume in the fourth quarter of 2017 were lower compared to the previous quarter. The average pre-tax production profit was 9 basis points (bps) in the fourth quarter of 2017, down from an average net production profit of 40 bps in the third quarter of 2017. The purchase share of total originations, by dollar volume, was 71 percent in the fourth quarter of 2017, down from 74 percent in the third quarter of 2017. For the mortgage industry as a whole, MBA estimates the purchase share at 63 percent in the fourth quarter of 2017. The average loan balance for first mortgages reached a study high of $254,291 in the fourth quarter of 2017, up from $251,109 in the third quarter of 2017. The average pull-through rate (loan closings to applications) was 76 percent in the fourth quarter of 2017, up from 73 percent in the third quarter of 2017. Total production revenue (fee income, net secondary marking income and warehouse spread) decreased to 362 basis points in the fourth quarter of 2017, from 375 bps in the third quarter of 2017. On a per-loan basis, production revenues decreased to $8,712 per loan in the fourth quarter of 2017, from $8,990 per loan in the third quarter of 2017. Net secondary marketing income decreased to 291 basis points in the fourth quarter of 2017, down from 298 bps in the third quarter of 2017. On a per-loan basis, net secondary marketing income decreased to $7,037 per loan in the fourth quarter of 2017 from $7,181 per loan in the third quarter of 2017. Total loan production expenses – commissions, compensation, occupancy, equipment, and other production expenses and corporate allocations – increased to $8,475 per loan in the fourth quarter of 2017, from $8,060 in the third quarter of 2017. For the period from the third quarter 2008 to the present quarter, loan production expenses have averaged $6,153 per loan. Personnel expenses averaged $5,560 per loan in the fourth quarter of 2017, up from $5,279 per loan in the third quarter of 2017. Productivity decreased slightly to 2.0 loans originated per production employee per month in the fourth quarter of 2017, from 2.1 in the third quarter of 2017. Production employees includes sales, fulfillment and production support functions. Net servicing financial income was $33 per loan in the fourth quarter of 2017, down from $79 per loan in the third quarter of 2017. Including all business lines, 56 percent of the firms in the study posted pre-tax net financial profits in the fourth quarter of 2017, down from 77 percent in the third quarter of 2017. “The end result was lower overall volume and production expenses that grew to $8,475 per loan – the second highest level reported since the inception of our study in 2008. Production revenues per loan also dropped, despite the average loan balance reaching a study-high,” Walsh continued. The average 30-year fixed-rate mortgage is 4.30 percent. The average 15-year fixed-rate mortgage is 3.75 percent. 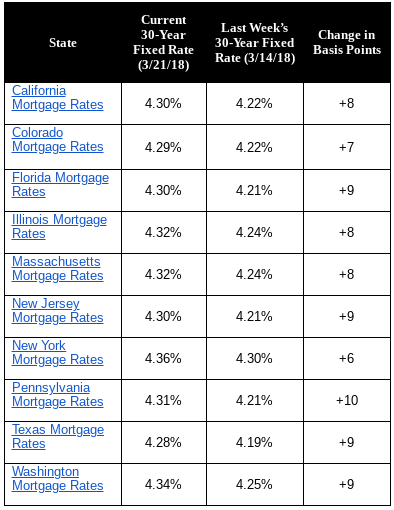 30-year fixed-rate mortgage (FRM) averaged 4.45 percent with an average 0.5 point for the week ending March 22, 2018, up from last week when it averaged 4.44 percent. A year ago at this time, the 30-year FRM averaged 4.23 percent. 15-year FRM this week averaged 3.91 percent with an average 0.5 point, up from last week when it averaged 3.90 percent. A year ago at this time, the 15-year FRM averaged 3.44 percent. 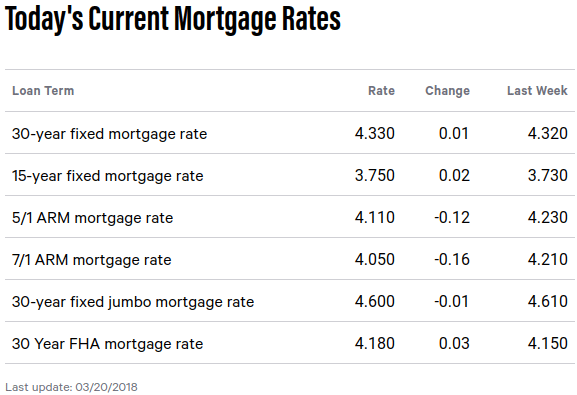 5-year Treasury-indexed hybrid adjustable-rate mortgage (ARM) averaged 3.68 percent this week with an average 0.4 point, up from last week when it averaged 3.67. A year ago at this time, the 5-year ARM averaged 3.24 percent. “The Federal Reserve raised interest rates today — a much-anticipated move that comes as both U.S. and global economic fundamentals continue to strengthen. The Fed’s decision to raise interest rates by a quarter of a percentage point puts the federal funds rate at its highest level since 2008. “The decision, while widely expected, sent the yield on the benchmark 10-year Treasury soaring. Following Treasurys, mortgage rates shrugged off last week’s drop and continued their upward march. The U.S. weekly average 30-year fixed mortgage rate rose 1 basis point to 4.45 percent in this week’s survey. 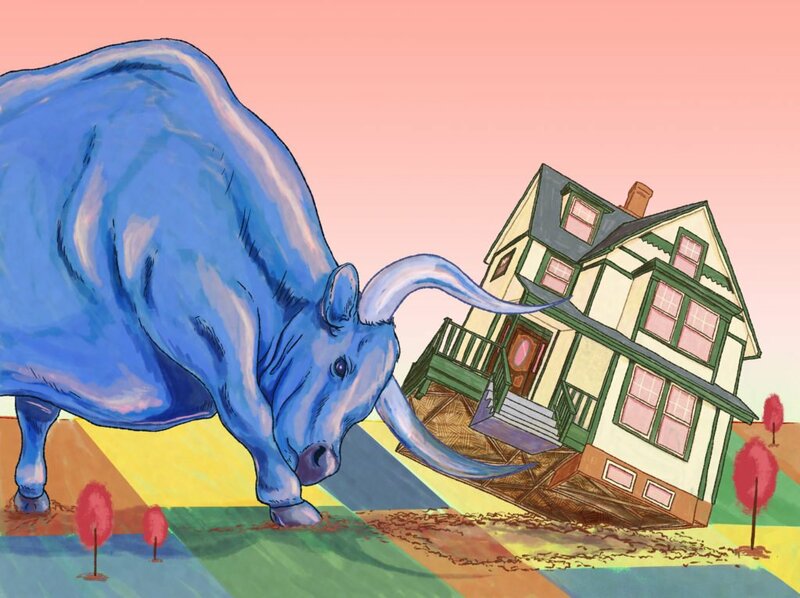 “So far, U.S. housing markets remain resilient in the face of higher mortgage rates. The National Association of Realtors reported this week that existing home sales in February increased 3 percent month-over-month on a seasonally adjusted basis and are up 1.1 percent from a year ago. Millennials are slower to reach milestones traditionally associated with adulthood, such as getting married, having children, and forming their own households. Even if later than previous generations, Millennials should soon begin to enter the housing market at a higher rate. 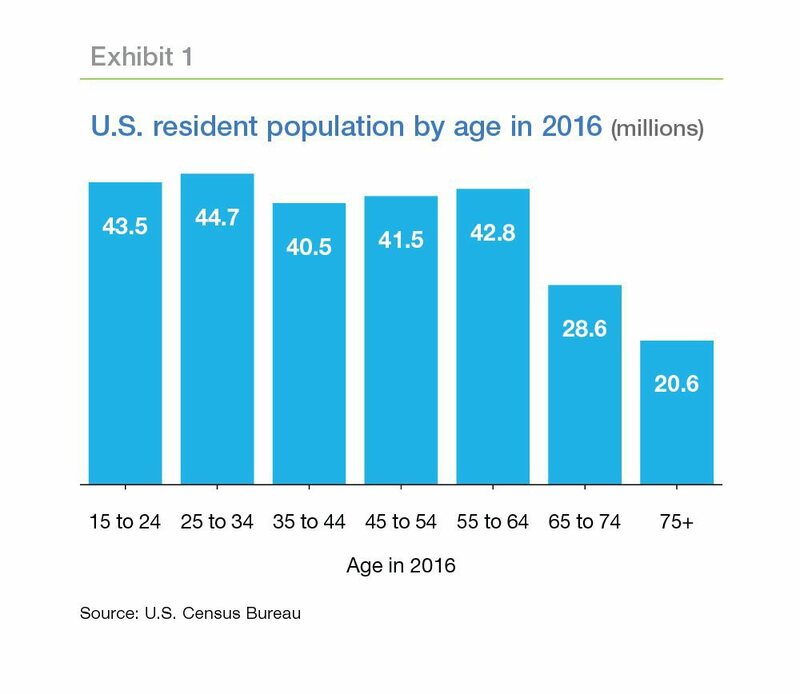 We expect that Millennials and the following generation, Generation Z, could add somewhere between 19 and 21 million additional net new households by 2025. 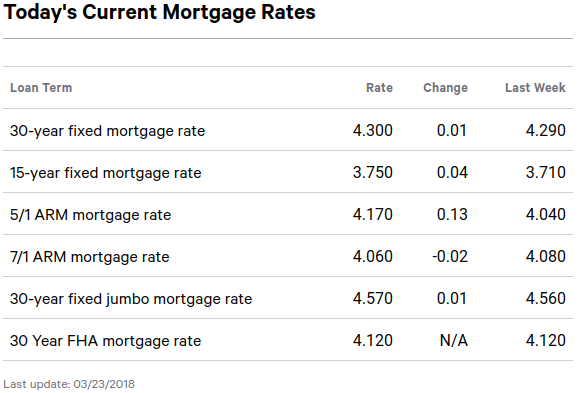 The 30-year fixed mortgage rate on Zillow Mortgages is currently 4.31 percent, up eight basis points from this time last week. 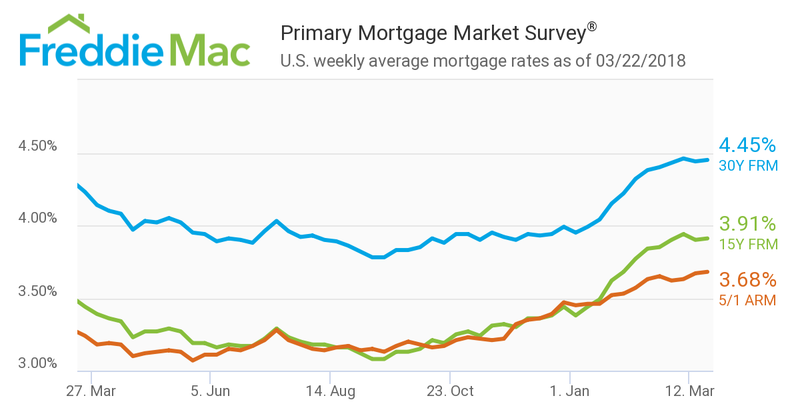 The 30-year fixed mortgage rate rose steadily over the past week. The rate for a 15-year fixed home loan is currently 3.73 percent, and the rate for a 5-1 adjustable-rate mortgage (ARM) is 3.68 percent. The rate for a jumbo 30-year fixed loan is 4.37 percent. “Home shoppers saw a slight reprieve two weeks ago when mortgage rates edged down for the first time this year, but that reversed over the past week as mortgage rates continued their 2018 trend and moved higher, once again matching their highest levels since spring 2014,” said Aaron Terrazas, senior economist at Zillow. The Market Composite Index, a measure of mortgage loan application volume, decreased 1.1 percent on a seasonally adjusted basis from one week earlier. On an unadjusted basis, the Index decreased 1 percent compared with the previous week. The Refinance Index decreased 5 percent from the previous week. The seasonally adjusted Purchase Index increased 1 percent from one week earlier. The unadjusted Purchase Index increased 2 percent compared with the previous week and was 6 percent higher than the same week one year ago. The refinance share of mortgage activity decreased to its lowest level since September 2008, 38.5 percent of total applications, from 40.1 percent the previous week. The adjustable-rate mortgage (ARM) share of activity decreased to 7.0 percent of total applications. The FHA share of total applications decreased to 10.3 percent from 10.4 percent the week prior. The VA share of total applications increased to 10.7 percent from 10.3 percent the week prior. The USDA share of total applications decreased to 0.8 percent from 0.9 percent the week prior. The average contract interest rate for 30-year fixed-rate mortgages with conforming loan balances ($453,100 or less) decreased to 4.68 percent from 4.69 percent, with points increasing to 0.46 from 0.45 (including the origination fee) for 80 percent loan-to-value ratio (LTV) loans. The effective rate remained unchanged from last week. The average contract interest rate for 30-year fixed-rate mortgages with jumbo loan balances (greater than $453,100) remained unchanged at 4.55 percent, with points increasing to 0.37 from 0.33 (including the origination fee) for 80 percent LTV loans. The effective rate increased from last week. The average contract interest rate for 30-year fixed-rate mortgages backed by the FHA decreased to 4.69 percent from 4.73 percent, with points increasing to 0.81 from 0.76 (including the origination fee) for 80 percent LTV loans. The effective rate decreased from last week. The average contract interest rate for 15-year fixed-rate mortgages increased to its highest level since April 2011, 4.12 percent, from 4.07 percent, with points increasing to 0.51 from 0.46 (including the origination fee) for 80 percent LTV loans. The effective rate increased from last week. The average contract interest rate for 5/1 ARMs decreased to 3.83 percent from 3.93 percent, with points increasing to 0.68 from 0.45 (including the origination fee) for 80 percent LTV loans. The effective rate decreased from last week. The level of commercial/multifamily mortgage debt outstanding at the end of 2017 was $3.18 trillion, $200.3 billion higher than at the end of 2016, or an increase of 6.7 percent, according to MBA’s latest Commercial/Multifamily Mortgage Debt Outstanding report released today. The fourth quarter of 2017 saw an increase of $73.6 billion, or 2.4 percent, over the third quarter, as all four of the major investor groups increased their holdings. Multifamily mortgage debt outstanding rose to $1.26 trillion, an increase of $41.6 billion, or 3.4 percent, from the third of quarter of 2017. “Commercial and multifamily mortgage debt outstanding continued to grow in 2017, albeit at a slightly slower rate than overall property values,” said Jamie Woodwell, MBA’s vice president of commercial real estate research. 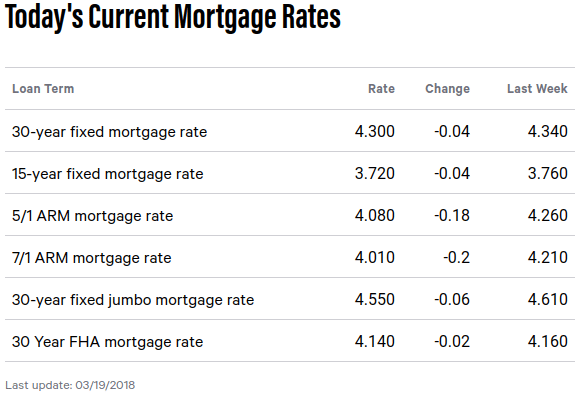 The average rate for a 30-year fixed mortgage is 4.33 percent, an increase of 1 basis point since the same time last week. A month ago, the average rate on a 30-year fixed mortgage was lower, at 4.31 percent. The average 15-year fixed-mortgage rate is 3.75 percent, up 2 basis points over the last week. The average 15-year fixed-rate mortgage is 3.72 percent.